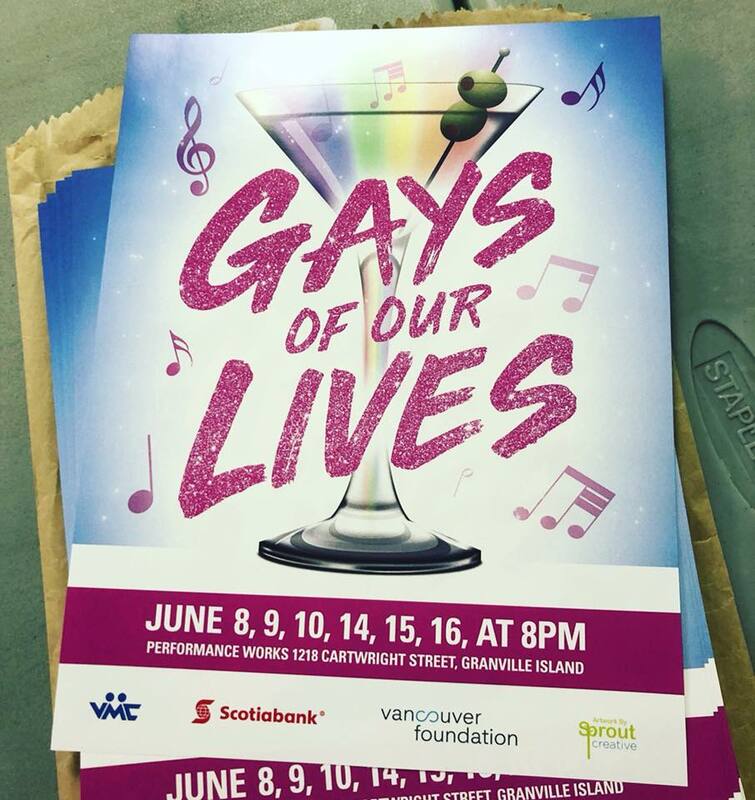 The next Vancouver Men’s Chorus concert is called Gays of Our Lives. I’ll get to the “Diva Medley” eventually. We’re also singing “I Shall Miss Loving You,” by Peter McWilliams and Kris Anthony. Running through this particular song at rehearsal last week transported me to my life in Chicago long ago. 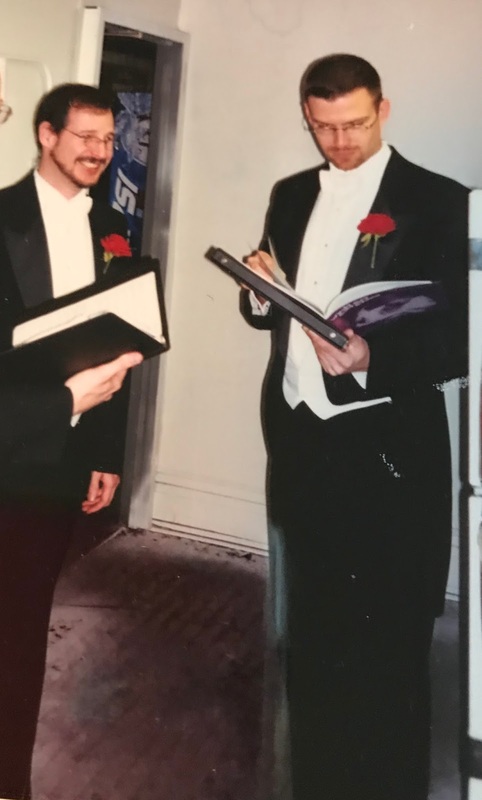 I was Director of the LGBT Rights/AIDS & Civil Liberties Project at the ACLU of Illinois, and sang with Windy City Gay Chorus from 1995 to 2000. Most of the songs and the many memorial services from that era blur together. However, I remember the last time I sang “I Shall Miss Loving You.” It was exactly eighteen years ago this month, at the memorial for one of our singers. My friend Jim Palmer. The miraculous new HIV/AIDS medications came along too late to stop the disease’s progress through Jim’s body. Still, he wanted to see the new millennium. He barely made it. Jim was thirty years old. I shall miss the comfort of your embrace…. As I previously wrote, our June concert also includes “Dance On Your Grave,” a furious danse macabre that channeled our communal rage at the cruel and inadequate response to AIDS. In contrast, “I Shall Miss Loving You” captures a different aspect of that era: learning how to live with grief. I was not the only member of VMC with tears in my eyes as we rehearsed the song. I’m surprised I found a photograph of Jim where he isn’t the one holding a rainbow-colored martini. As a writer, I have a complicated relationship with Memory. Seeing pictures or chatting with old friends can trigger the retrieval of long-lost events from the deepest recesses of our minds. But I’m most interested in what our brains hold on to, after the passage of time filters, sorts, and shapes our core memories. This is the Jim who endures: charming and fun, kind and boyish, handsome but modest. He was the perfectly poised “Plus One” – ready to accompany you to the opera, family dinner, or a leather S & M convention. With an implausibly suitable outfit for each already waiting in his closet. Jim went to Vassar, not long after the historic women’s college finally admitted men. He dressed like a fop and bantered like Oscar Wilde. Jim was never the butchest spoon in the drawer. But this was the 1990’s, long before the internet and It Gets Better. 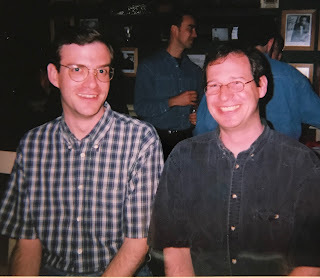 So Jim didn’t formally come out to his parents until he was in his twenties. They were the usual Reagan era WASPy conservatives; his dad was ex-military. Coming out was stressful for Jim, but it went well. As usual, his parents already knew – but not because of Jim’s foppish taste in youthful attire. Instead, a couple of years before, the FBI told Jim’s parents he was gay. It came up during a background check for his dad’s security clearance. 1In a delightful bit of irony, the defining theater event of our era, Angels in America, centers on a closeted gay Mormon lawyer and his family, but it was written by gay Jewish playwright Tony Kushner. And the most successful Broadway musical this century is the funny and profane Book of Mormon, from the iconoclastic creators of South Park. Mormonism bubbled out of one of the perennial religious percolations that infuse American history. In many ways, the LDS Church is a Puritan reaction (and overreaction) to the “vain repetitions” and pope-ish apostasy that preceded it. 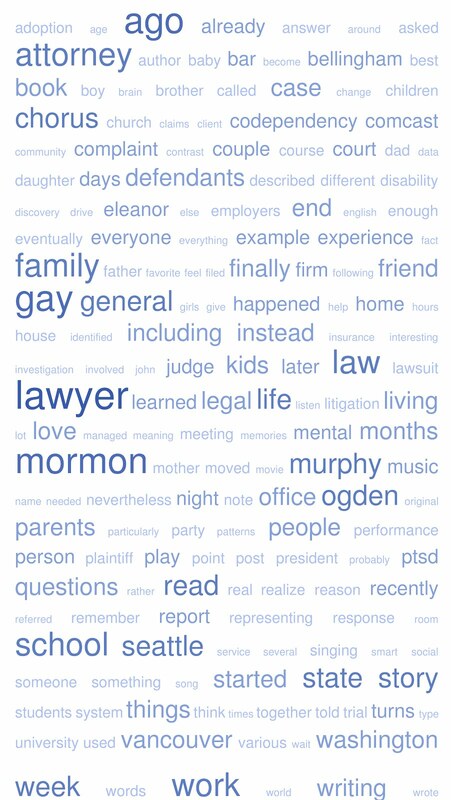 When it comes to music, Mormons are pretty much Philistines, generally sticking with simple hymns played on a piano. Or maybe a cheap electric organ, if some matron or closet case from the congregation can remember their childhood music lessons. This means I grew up without being exposed to any of the great church music that occupied composers for hundreds of years. 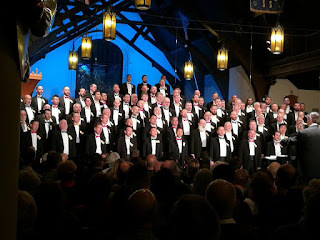 Attending Anglican services and singing in the excellent choir at Saint Mark’s Episcopal Cathedral in Seattle finally introduced me to the glories of Western music. It’s what I’m listening to right now. In addition to its English text, “I Shall Miss Loving You” includes an antiphonal counter melody in Latin: Agnus Dei, qui tollis peccata mundi, dona eis requiem. It’s the heart of the ancient requiem mass: “O Lamb of God, who taketh away the sins of the world, grant them peace.” The most sublime musical experiences of my life include singing Barber’s setting of the “Agnus Dei” (it’s the choral version of his famous “Adagio For Strings”) with Windy City Gay Chorus, as well as singing Herbert Howells’ exquisite modern Requiem at Saint Mark’s. 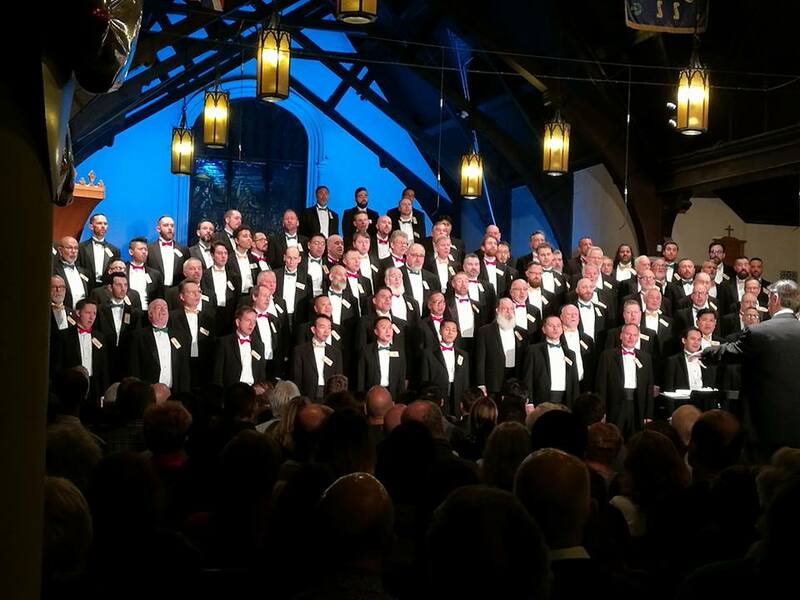 Sadly, however, Vancouver Men’s Chorus is omitting the Latin text. We will be singing “loo” instead, because our conductor is uncomfortable when VMC’s music gets too churchy. So I’m bummed. Yes, I realize that makes me a complete hypocrite. 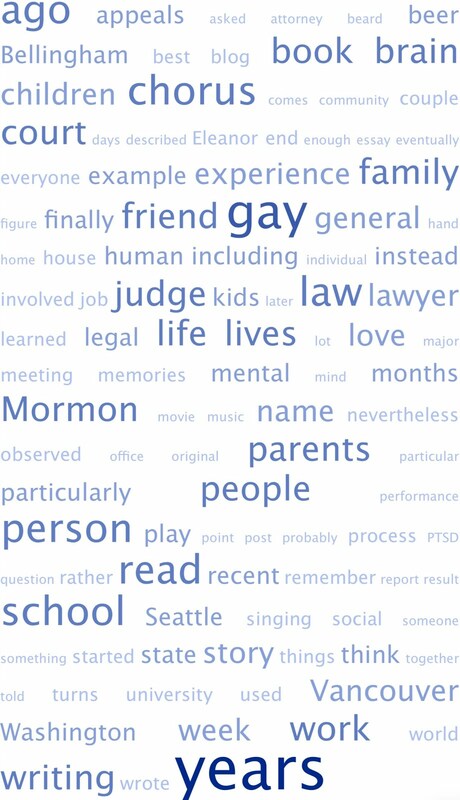 My own PTSD was caused by anti-gay trauma inflicted by the Mormons. Many LGBT individuals are equally scarred by experiences in other faith communities. Sigh. I suppose I’m lucky I wasn’t exposed to incense or Mozart as a child. Regardless of our backgrounds, grief is a process. The familiar Latin requiem text memorializes the lost, and also our loss. For example, the powerful movement “Dies Irae” – “Day of Wrath” – from Mozart’s Requiem channels my anger, just like “Dance On Your Grave” from Naked Man. But rage and pain eventually wear away, leaving love and remembrance.